The Minnesota Vikings defeated the Seattle Seahawks on Friday night, 21-20, continuing the third full week of preseason action in the NFL. The Seattle first-team offense struggled to get much going in the dress rehearsal against the Vikings. Whether you view him as an offensive or defensive player, rookie punter Michael Dickson out of Texas easily stood out while playing a critical role in the field position battle. He started out his day with a 57-yard punt that bounced out-of-bounds at the Minnesota 3-yard line and then flipped the field with a 56-yard punt from his own 41-yard line that bounced out-of-bounds at the Vikings 1-yard line. Dickson averaged 53.6 yards on five punts and 268 total kicked yards. 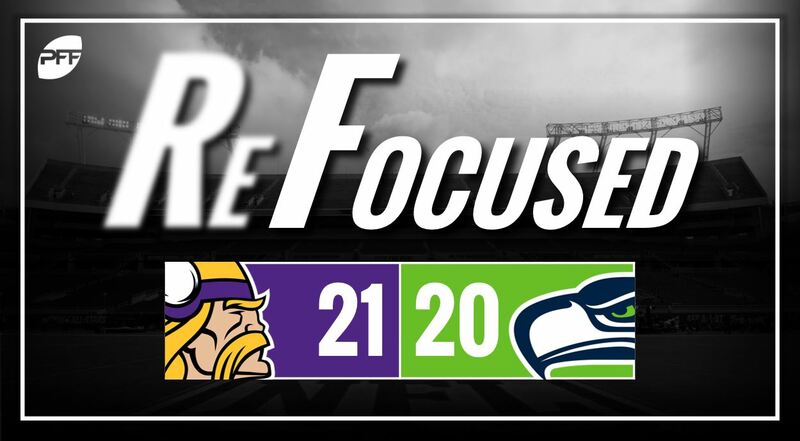 We didn’t get to see rookie first-round running back Rashaad Penny due to his finger injury, but Chris Carson displayed signs of being back to full health by cutting effortlessly through the Vikings’ defensive line for a six-yard touchdown. His effort was combined with another healthy display from wide receiver Brandon Marshall, who had been recovering from multiple ailments. Quarterback Russell Wilson connected with Marshall on a fade route to the left sideline for a 20-yard gain in the coverage of cornerback Xavier Rhodes. The Seahawks’ starting secondary had a solid showing, limiting the damage done by the Vikings’ impressive trio of Adam Thielen, Kyle Rudolph and Stefon Diggs. Sophomore No. 1 corner Shaquill Griffin specifically showed good fight in his battles with Diggs. While Diggs did beat him on a handful of plays, Griffin was always competing. He made a great pass defense on a first down slant route by Diggs on the Vikings’ first drive of the game, as well. As far as the backups go, the most impressive Seahawk defender by far was defensive tackle Poona Ford. He was nearly unblockable against the Vikings’ offensive line. He managed to rack up multiple defensive stops by knocking his man back two yards every time before effortlessly shedding him and making the tackle. He also had a nice pressure on a good pass rush, something he wasn’t well known for at Texas. Quarterback Kirk Cousins played the entire first half but didn’t really do much to impress against the Seahawks’ starters. His numbers looked fine, but they don’t tell the story of a quarterback who checked down on what seemed like almost every throw. Though he did have one extremely picture-perfect back-shoulder throw to Diggs at the end of the first quarter that went for 27 yards. The Vikings’ biggest offensive issue continues to be the offensive line. The starters were more or less manhandled by the Seahawks’ front-seven in both the pass and run game throughout the first half. The running back combination of Dalvin Cook and Latavius Murray averaged just barely over two yards per rush, and that was a direct result of the offensive line failing to open up holes or execute their blocks properly. Wilson attempted to connect with running back Mike Davis lined up wide right, but linebacker Eric Kendricks made a fine play to swat away the vertical target. Later in the second quarter, fellow linebacker Anthony Barr pulled Davis down on a route out of the backfield and followed that up with a hit on Carson that knocked the ball away on the next play. The Vikings were able to hold onto the victory but nearly gave it away on a 55-yard Hail Mary to close out the game. However, the secondary played a solid game that was highlighted by a pass deflection from newly signed safety George Iloka that left the ball in the air just long enough for safety Anthony Harris to collect the interception. Seattle: The Vikings’ secondary only permitted nine passing first downs to Seattle receivers. And Seattle quarterbacks completed less than half of their total passing attempts and the defense denied 9-of-15 third-down attempts — an extremely strong showing from a defense appearing to be in midseason form. Minnesota: Minnesota would’ve had this game in the bag if their offensive line could’ve blocked better in the first half. But ultimately, it was Cousins’ inability to stretch the field that forced the backups to have to make a dramatic late-game comeback.